Tagsenses from xtrmtggng on Vimeo. The tagging of a resource by a Folksonomy user with tags chosen by him /her is problematic, because every user chooses their own tags that are dependend on their point of view on the resource. This view is subjective and therefore probably not exactly the same as the views of other users. The subjective aspect makes it difficult for other users to find a tagged resource. Especially tags ambiguity and tags synonymy are causing problems to the retrieval of resources, because they lower the quality of a keyword based search. Whereas ambiguity of keywords lowers the precision and synonymes of keywords, that are not used in the search, lower the yield of a search. 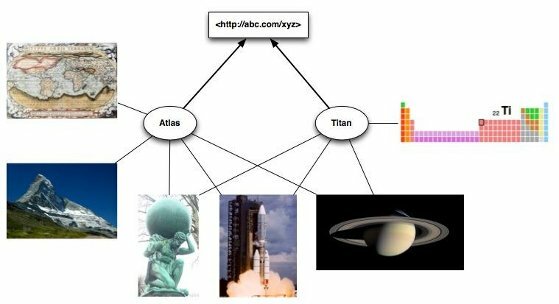 An example for an unknown resource, which is marked with the tags "Atlas" and "Titan" is shown in the figure below. Without additional information it is not clearly to decide to which keyword based queries the resource is an appropiate answer. To solve or at least reduce these problems of retrieval in Folksonomies the method called "algorithmic Extraction of Tag Semantics (aETS)" described in the following was developed. It is based on a four-phase process, which generates an ontology of the semantic relations between the tags of a Folksonomy. The developed method disambiguates the keywords and determines synonym keywords without using external systems, such as WordNet. Hence the method is independend of the language used in the Folksonomy and is even capable of processing recently evolved terms, which may not be included in external systems.